JELCO JL-45 TONEARM LIFTING DEVICE. (#170306956855) £109.99. (#170299883237) £25.99. (#170301927507) £19.99. 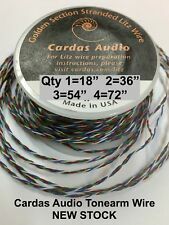 CARDAS AUDIO MULTI STRANDED LITZ TONEARM WIRE 4X33 AWG GOLDEN RATIO. 18" LENGTH OF ALL 4 COLORS. OR MORE. SEE BELOW. Litz wire is a type of specialized multistrand wire or cable used in electronics to carry alternating current (AC) at radio frequencies. Every set carries 4 pieces transparent 400mm long 30AWG 5N Pure Silver wire for a more cleaner sound. 99.999 % silver transmits electrical signals faster and with less distortion than ordinary OFC wires. Mk 1 ffss arm in good condition. It's wired as you can see. The price is for one adaptor, we have a total of seven available. Not sure if these have been used before, and the boxes are a bit rough. The tonearm is made ofwenge wood. ABEC-7 and 9 bearings are used. all other parts are made of stainless steel and aluminum. silvered wires MC-16-33 are used. They are used in the aviation industry. Condition is Used. Or ig in al D en on C ab le. Wi ll f it o th er models, in cl ud es c ab le h ol d downw /s cr ew. Ni ce a nd soft an d flexible. Precision crafted using clear acrylic with crystal clear print. Highly Clear; Material: Acrylic. Color: Clear. Material: Acrylic. The color may have different as the difference display,pls understand. Increase the performance of your Tonearm. 36 AWG ; OD 0.28 mm. 7 core silver plated high purity copper with PTFE insulation (Teflon). Each core is 0.05 mm. All the characteristics required in wires for tonearms are gathered here. Tonearm wire for internal rewire of turntable tonearm 5M wire. Due to the difference between different monitors, the picture may not reflect the actual color of the item. 1 x PU leather bag. Features: High definition, high penetration, easy to use. 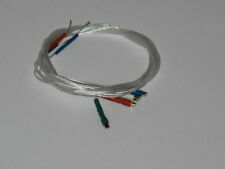 STEREO TONEARM SHIELDED OFC LEAD / WIRE. Length: 400mm. Thickness (mm) 0.18 / Nom. Thickness (mm) 0.22. Tinned copper wire spiral shield. Colour-coded lead free PVC jacket. Construction(mm) 7/0.08. Thickness (mm) 0.12. Replace the stylus on your record player with this universal phono headshell. Length: 50mm/ 1.97in. Wire Leads only, other accessories demo in the picture are not included! 1 Pc x White Wire Leads. 1 Pc x Red Wire Leads. PIONEER PL-50 TONE ARM & REAR WEIGHT. THIS IS THE FACTORY ORIGINAL PART MADE IN JAPAN. 1x Azimuth Ruler. Headphone Amplifier. Speaker Frequency Divider. Speaker Protection. Tube Headphone Amplifier. Speaker Unit. Finished Speaker. Dock Cable. Bronze Bearing Housing For Ortofon 212 and other Ortofon tonearms. Lenco L78 & Ortofon 212 tonearm with bronze bearing housing - YouTube. The bearing housing is manufactured from a high quality bronze on high precision CNC machine and hand-finished to create a smooth and shiny surface. Length: 131mm. Type:turntable straight tonearm tubes. Application: Compatible with many known turntable or audio combo system in the market. These are ONE PIECE of high quality machined acrylic. Check out the exceptional fit and finish using the magnifier. They look amazing. Acrylic is a great material for armboards because it will dampen unwanted resonances, preventing them from reaching the tonearm. The wire is 33AWG stranded OFC copper with 2 mils PFA Teflon dielectric. (PFA is the highest grade of Teflon available) The wire is color coded and twisted around each other to reject RFI and EMI when in the arm tube. Hello music on vinyl lovers. The Q UP is a high precision device that safely lifts your tonearm at the end of the record. The Q UP can be installed in minutes, without tools, and is designed to fit on most manual turntables. Nobsound®——Douk Audio. 1set ofAutomatic Tonearm Lifter. Safely lift your tonearm at the end of the record. Trigger-and-lift design is easy to install and compatible with almost every ‘tonearm on the market, independent of shape, thickness, or height. An armboard plate to allow easy installation of Jelco SA-750, as well as 550 850 950, tonearms to Thorens TD-160, TD-145, TD-165, TD-166, TD-166 MKII, TD-160MKII, TD-160 Super and TD-147 turntables. Included with your armboard are three stainless steel screws for attaching the plate to the table and three socket screws for attaching the arm to the armboard. The bottom screw insert plastics broke off and will need to be fixed or reglued. Type:turntable straight tonearm parts set Lot size: 1 set. Application: Compatible with many known turntable or audio combo system in the market. EVERY PARTS SET INCLUDE. Tonearm lift to fit Audio Technica ATP-12T tonearm. I've built and sold many of these, they work great. Picture directions included with product. Tonearm not included. This bearing housing is without polishing and final finishing, you will get the detail in the exact way as it shown in the photo! The bearing housing is manufactured from a high quality bronze on high precision CNC machine. An armboard plate toallow easy installation of Rega RB 101, RB 251, RB 202, RB 220, RB 303, RB 330, RB 700 and RB1000 tonearms to Thorens TD-160, TD-145, TD-165, TD-166, TD-166 MKII, TD-160MKII, TD-160 Super and TD-147turntables. You are looking at our 24" 99.990% (5n)Pure Silver and Teflon Ultra-flexible tonearm wire set ( each set consists of 4 wires, attached to each wire is our custom cast pure copper and 24kt. The wire starts out by being drawn thru a 31ga. ). Hope you could understand. we support wholesales. Model Show Features: High-definition, high transparency, easy to use. Ahh finally an on the fly repeatable vta for your jelco sa 370 750 ts-550 sumiko mmt tonearms. This VTA will not work on any other Jelco Arm so don’t ask. In my humble opinion Jelco arms are amazing. The vta assembly weighs 4.1 oz or 116 grams. CW1 Heavy Counterweight. Counterweight for turntables with 9mm stub. Safely lift your tonearm at the end of the record. Can be used with most bearing tonearm types from uni-pivot to gimbal. 1pcAutomatic Tonearm Lifter. Trigger-and-lift design is easy to install and compatible with almost every tonearm on the market, independent of shape, thickness, or height. TWO (2) LENCO TONEARM HEADSHELLS. MISSING FINGER LIFT ON ONE HEADSHELL.